Katie Creeger at Ecovillage at Ithaca rocks. She organized a root CSA in which White Hawkers were invited to participate. The result? Greg's root cellar is stocked with loads of local organic veggies for us all, and my mind is on soup. Thanks also to Marty who suggested we participate. While at EVI, I got to see their earth-bermed community root cellar. Neat! Just today Greg finished software that will operate the root cellar fan to maintain optimum temperature and humidity. We already had some squash and other assorted veggies. Today we added onions, potatoes, celeriac, beets, parsnips, turnips, carrots and cabbage. The root cellar is also an excellent place to store my beloved bulbs. 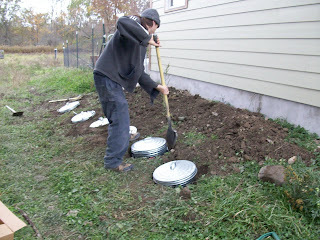 We're keeping our apples outside in winter storage--small garbage cans buried in the ground. That's Steve putting the finishing touches on the fancy apple cans.